One of the biggest challenges to working out is simply finding the time. Everything else can be in place but if you can’t or won’t take the time out of your schedule, transformation will never happen. That’s why Tony Horton, of the world famous P90X, developed his newest P90X3 system. P90X3 is Tony and Beach Body’s newest revolution in advanced fitness. Instead of the normal 60 minutes to an hour and a half workout, P90X3 can be completed in exactly 30 minutes. That’s right, you read correctly. P90X3 is a 30-minute workout. But don’t let the shortened time fool you. This system holds the same intensity as the other P90X workouts, but can be completed in half the time. And just like all the other P90X workouts, you don’t even need to leave your front door. Tony Horton has quickly become one of the most world renown at home personal trainers. 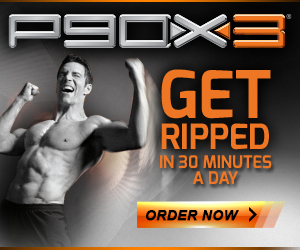 And it’s no wonder with his fitness programs such as P90X, P90X2, 10 Mintue Trainer, Power 90, and now his all-new P90X3. Early in his career Tony found his way to Las Angeles, where he worked as personal trainer as well as took a few stand up comedy gigs on the side. In 2002, while still living in LA, Beach Body CEO, Carl Daikaler, approached him about an idea to create a new revolutionized workout system. Carl’s idea was centered on trying to create a program that would give anybody amazing results fast. Tony took this idea and brought it to life in 2003 with his all famous P90X workout system. Tony has helped thousands of people worldwide become stronger and incredibly fit through all of his P90X programs. He also revolutionized the fitness industry with his famous technique of Muscle Confusion. This process was developed to keep your muscles from becoming acclimated to your fitness routine. Which in turn creates for better faster results. Tony has kept this technique alive in his P90X3 workout program, but now he has given it to you in a condensed, beautiful, 30-minute workout. Like Tony’s other workout programs, P90X3 requires a few certain things to get started. One, you need some equipment such as dumbbells or resistance bands and a way to do pull ups. That can be a pull up bar, tower, or an attachment to your door for your resistance bands. There is other recommended equipment as well, although it’s not required, such as a yoga mat, PowerStands, the P90X Chin-Up Max, and the P90X App. The Second thing you’ll need for this workout is space. Thankfully you don’t need much of it. Just a few square feet where you can jump around and get sweaty. Third, you’ll need a TV or laptop to play the DVD (no brainer right?). And finally, like with all the other P90X workouts, you need motivation and discipline. A commonly asked question about this system is “How can you achieve the same P90X results in only 30-Minutes?” This is a good question that has an even better answer. According to studies the most dramatic body transformation happens within the first 30 minutes of the workout. While longer workouts can still prove to be immensely effective in building further endurance and strength, it is not required to get a totally ripped and fit body. Tony’s goal in creating this workout was to utilize every second of those first 30 minutes to help you completely transform your body. And here’s how he did it. This workout combines intensity with a high structured, plateau-busting schedule and movements that are sure to leave you a little breathless. Tony and his team took everything they’ve already proven works, such as Muscle Confusion and Muscle Integration, and customized it into a condensed time frame. And just to be sure they got it right; they put it to the test with a few special guinea pigs. The results were fantastic. The average fat loss in the group was 34%. Which even at an hour workout that number is incredible. But this group achieved those results in only 30-minutes a day for 90 days. P90X3, while condensed, is still an extremely tough workout. But don’t let that scare you away. It’s still achievable and it’s guaranteed that almost any one can accomplish it. In fact, it’s the perfect workout even for beginners because it offers modified moves throughout the whole program sequence. It’s even suggested that if you want to work up to be able to do a workout like P90X3, start with P90X3. It’ll be a surefire way to get the body transformation you’ve always wanted. One difference, besides the time, in P90X3 versus the other workouts is that there are 16 workouts included in this program. They are broken down into four categories; Power Workouts, Cardio Workouts, Resistance Workouts, and Core, Flexibility, & Balance Workouts. Each section is designed to work in sync with each other to provide you with the ultimate workout experience. In the Power Workouts your will see Agility X, which is the fusion of aerobic and anaerobic energy which improves your precision, flexibility, balance, and strength. You’ll also see Triometrics, which will help increase your speed and power in this revolutionary plyometric workout. The last workout you’ll see in this section is the Decelerator. This helps your ability to go up strong and down safely with multi-angle training. The Cardio Workouts provide you with exercises like CVX, which combines resistance with intervals that give you a full-body burn and strengthen your core. It also includes MMX, which helps you burn fat by challenging your strength, endurance, and flexibility with a martial arts twist. The final cardio workout is Accelerator. This workout increases your cardiovascular and muscular efficiency, which provides a major fat burning workout. Core, Flexibility, & Balance Workouts are where you’ll get an intense workout while using mostly your own body weight to get the job done. You’ll start with X3 Yoga, which improves your musculoskeletal flexibility, balance, stamina, and core strength. Pilates X, which powers your core and helps to gain muscle elasticity and stabilize your joints. As well as Isometrix and Dynamix, both give you a fantastic workout in only 30 minutes. The most workouts will come from the Resistance Workouts. Here you’ll see things like Total Synergistics. Which is a full-body resistance workout that triggers fast and powerful changes to your body’s composition. You also have The Challenge. This strengths your back using push-ups and pull-ups in ways you didn’t even realize existed. You’ll also have The Incinerator, The Warrior, Eccentric Upper, and Eccentric Lower, all workouts designed to bring out the fittest and healthiest version of you. Committing to a workout program can be tough. But it’s always necessary if you want to take that next step into fitness. Whether it be working out at a gym or doing it at home along with someone like Tony Horton, the only way to get a strong, fit, and ripped body is to make a commitment to yourself that you’ll do what it takes to get the job done. Thankfully though, unlike going to a gym, a system like P90X 3 makes it easy to do exactly that. Tony and the whole Beach Body team not only provide you with the 16 DVD workouts but when you order a kit you’ll also receive several other bonuses that will help you in your journey. One thing that is included in the basic kit that is an absolute must have is the Nutrition Guide. Tony breaks down for you exactly what you need to eat, when you need to eat, how much to eat, and the appropriate foods for your body type. Proper nutrition is a key part into weight loss, and without the proper diet you may as well forget the intense workout. Both diet and exercise go hand in hand when trying to build a stronger and better you. Another helpful thing included is the Fitness Guide, which is your step-by-step guide into your 90-day P90X3 journey. It breaks down every move so you know exactly what to do and how to do it. He also includes the P90X3 Workout Calendar. Tony gives you each day’s workout so you won’t ever be lost and can follow right along. And finally you’ll receive the “How to Accelerate” DVD. This is an easy-to-follow introduction that will help show you how you can achieve the best results in the shortest amount of time. Don’t wait another day to start your total body transformation. P90X3 can help you get exactly what you’re looking for in only 30-minutes a day. And even though it’s not always going to be easy, with dedication and hard work you can achieve results beyond your wildest dreams. So join Tony and his team and let them help lead you into a stronger, fitter, and healthier you. When you purchase the P90X3 DVD Package you get 16 Extreme 30 Minute Workouts, a fitness guide, a nutrition guide, a workout calendar, the how to accelerate DVD and a Free Bonus, the On One Leg workout. With the P90X3 Deluxe DVD Package you get everything in the base package as well as 3 additional extreme workouts, 3 pro grade resistance bands, and x3 Ab ripper, a amazing core workout program. With the P90X3 Ultimate DVD Package you get everything in the Deluxe program as well as the following; 3 Pro Grade resistance bands, a months supply of E&E Energy and Endurance, a elite workout calendar, a jump mat, 1 month supply of the P90X Results and Recovery Formula, the Chin-Up bar, and the P90X Chin-Up Max – a device that supports you when doing chin-ups.